Here are a few shots of the Broadway Fountain from here in Madison Indiana, when you are looking for something cool to post on your blog and can’t seem to find something that really interests you the fountain is always a go to post lol !! The fountains offers a variety of seasonal compositions that make it an amazing subject to photograph. From the Christmas lights with snow to the spring time back ground of red-bud the summer green with flowers and my favorite time of all the beautiful fall leaves that frame it so well. If you travel to Madison it is always a sure bet to stop by the fountain, you can never go wrong photographing this amazing structure it makes a wonderful image to capture on your trip. Thanks for stopping by a having a look! Changing up a bit here and I think I will start posting images from what is my favorite subject to photograph and that is wildflowers. And I will share them from one of my favorite spots to photograph at Clifty Falls State Park near Madison Indiana. Clifty has an incredibly diverse amount of wildflowers and some of the finest displays in the midwest. If you get a chance to visit in mid to late April I would definitely make the trip I don’t think you would be disappointed not only are the wildflowers worth the trip but hiking in the park is second to none. 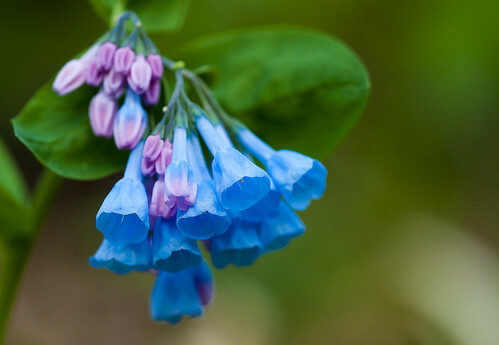 The subject I am sharing today is also one of my favorites and that is the Virginia Bluebell. That is the detailed description which I am too lazy to come up with myself and I will share one of my original images I captured earlier this spring. Hope you enjoy the info and image and thanks for taking the time to stop by and take a look. In the time I have been away from this blog many things have happened in our community of Madison Indiana and one of the great things was the opening of the new Madison Milton bridge. Many who had traveled the old bridge can tell stories of how bad it shook or meeting a large vehicle coming from the other direction and thinking you wouldn’t make it thru, and there were many mishaps on the bridge as well. But all that changed with the new bridge. The lanes are very wide and it has a great pedestrian walkway built on the outside of the bridge as well. So travel over the new bridge has a totally different feel than the old one. But the old one had some pretty cool character to it and it was great to photograph as well. So I thought I might start sharing some photos of the new bridge just so you can see for yourself in case you never get to drive over it. 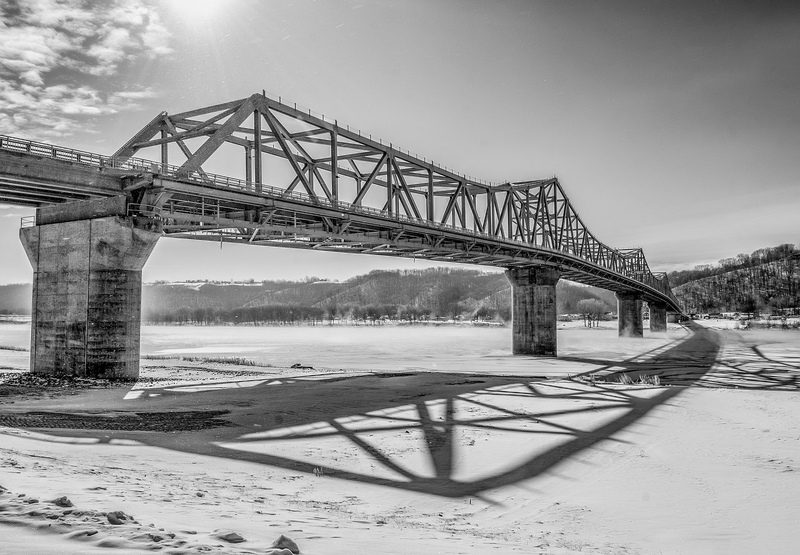 This image came last winter and I really like how the bridge was throwing down that great shadow over the landscape. With the snow and cold I thought it was best processed as a black and white conversion to show the mood in the valley that day. I will share more in the days ahead and I hope you enjoy this image and thanks for stopping by and taking a look !! In early June I was able to attend an event I have been hoping to see for quite some time, and that is the Synchronous Fireflies of the Great Smoky Mountains. Synchronous fireflies (Photinus carolinus) are one of at least 19 species of fireflies that live in the Great Smoky Mountains National Park. They are the only species in America whose individuals can synchronize their flashing light patterns. Fireflies (also called lightning bugs) are beetles. They take from one to two years to mature from larvae, but will live as adults for only about 21 days. While in the larval stage, the insects feed on snails and smaller insects. Once they transform into their adult form, they do not eat. Their light patterns are part of their mating display. Each species of firefly has a characteristic flash pattern that helps its male and female individuals recognize each other. Most species produce a greenish-yellow light; one species has a bluish light. The males fly and flash and the usually stationary females respond with a flash. Peak flashing for synchronous fireflies in the park is normally within a two-week period in late May to mid-June. No one is sure why the fireflies flash synchronously. Competition between males may be one reason: they all want to be the first to flash. Or perhaps if the males all flash together they have a better chance of being noticed, and the females can make better comparisons. 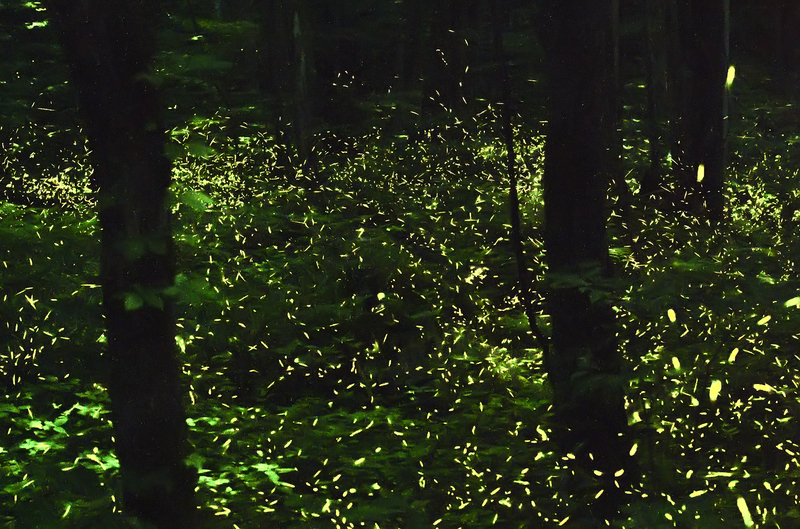 The fireflies do not always flash in unison. They may flash in waves across hillsides, and at other times will flash randomly. Synchrony occurs in short bursts that end with abrupt periods of darkness. Here is a pic from the Firefly Event, the pic doesn’t do it justice. This is truly an event that must be witnessed, even after a few days I still couldn’t convey the words on exactly what happened !! The lights from the fireflies moved in waves up and down Elkmont Valley where we positioned ourselves, the pattern seemed to start far from us and be in strips of thousands of lights and would then stream across the bottom right toward us and then stop at our feet. Then continuing on across the road at our backs towards the other side of the valley floor. There would be burst of 5 flashes quickly then it would stop for 10 seconds or so and then repeat in an almost frenzied fashion !! The human reaction was incredible, when we first arrived hundreds of people were packed along the old roadbed that runs along the valley floor, many with lawn chairs and blankets making you think you were attending a fireworks show. At first as the light faded you could feel the crowd growing impatient, people were laughing and talking and when one little firefly would appear they would remark is that it…I even began to wonder myself !! The Park Rangers assured us to be patient and wait for the show, When it started the crowd was amazing, people at fireworks display usually oh and ah thru the whole event, but here there was an incredible silence as if the fear of your voice would scare them off and they would stop the beautiful display they were sharing with us. Many in the crowd were brought to tears, including my wife, they were overwhelmed with such joy and amazement that the emotion displayed was almost as cool as the fireflies !! Ok after this way too long post here is the pic, like I said before they are not that good and they don’t really represent what I witnessed but it is something I will have forever to help me remember that warm wonderful summer evening !! Rock Abstract, a photo by Bernie Kasper on Flickr. With our first real heat wave of the year approaching, I thought I might post an old image that I reworked and posted on Flickr. It has a definite fall flavor with the colorful leaves and cool water rushing by, hopefully it can at least make you think it feels a little like fall lol !! 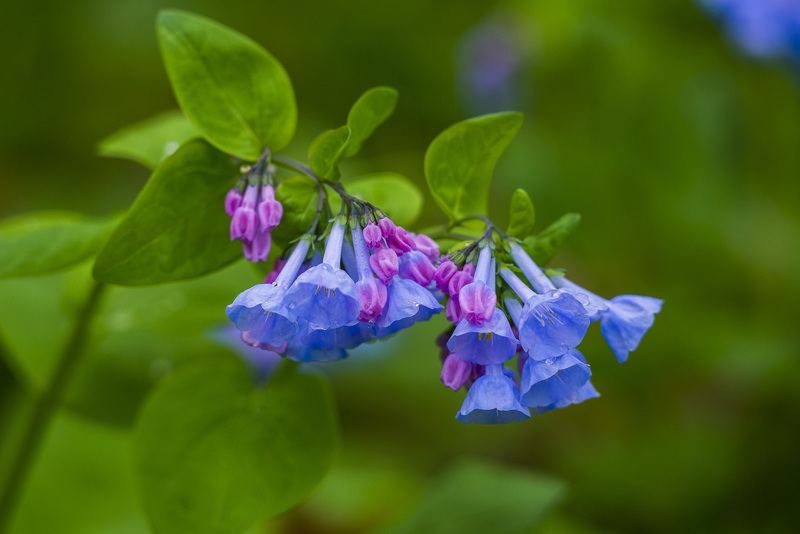 Virginia Bluebell, a photo by Bernie Kasper on Flickr. A light at the end of the tunnel looks like this is the last really cold night and temps here in Madison are supposed to start rising into the 60-70 degree mark the next week..it’s time ! !